But one major operator says bricks-and-mortar firms are simply ‘unable to take competition’. RETAIL AND FOOD groups want the government to “level the playing pitch” and toughen laws around pop-up markets – but one major operator says bricks-and-mortar outlets are just afraid of the competition. Earlier this month, Business Minister Heather Humphreys launched a public consultation on the Casual Trading Act 1995 and Occasional Trading Act 1979. 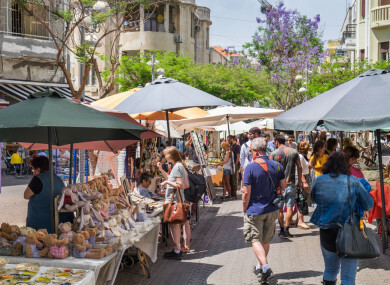 Both pieces of legislation govern the rules around licensing, consumer protection and the selling of various products at daily or weekly markets, as well as annual events including concerts and on-street market stalls. Humphreys said that it was time to revisit the acts and “examine if they are still fit for purpose” due to the changes in retail and trading environments since the laws were introduced. Lobby group Retail Excellence, which represents more than 1,700 businesses in Ireland, has said the existing laws are “obsolete” and don’t reflect modern retailing. The organisation has previously called for a clampdown on casual trading and urged the government to increase An Garda Síochána and Revenue resources to stamp out the selling of counterfeit goods. “What we’ve seen, in the last number of years in particular, is a significant increase in the number of markets both on public land and indeed on private land,” Retail Excellence CEO Lorraine Higgins told Fora. She said that from interacting with the group’s membership, she believes that pop-up markets can impact physical stores’ turnover “by up to 20% on any given day”. Higgins suggested that many market operators, particularly in the food space, have an “unfair advantage” over permanent establishments because they work off a lower cost base. “There’s no requirement for them to have certain facilities which would be absolutely essential to a food retailer, be it toilet facilities, sinks, disabled access,” she said, adding that stall owners also don’t have to pay commercial rates to the local council like fixed businesses. She also questioned whether the various markets, particularly those operating on private land, have obtained the planning permission required to do business. Thomas Burke, CEO of Ibec group Retail Ireland, welcomed the launch of the public consultation and said it is “probably overdue”. He said the organisation has received comments from members “around their perception – real or otherwise – that there’s a real imbalance in terms of the cost of doing business in a physical retail structure and the cost attached to marketplace-type activity”. “There’s a sense that if we have to pay a fairly hefty rates bill to the council ever year, what are the (pop-up) businesses doing … to ensure that the environment is maintained around the high-street and that there’s a steady stream of funding going back to the local authority?” he asked. Restaurants Association of Ireland CEO Adrian Cummins said that market stalls offering takeaway food don’t have to adhere to the same strict hygiene laws as bricks-and-mortar establishments. However Declan Vallely, the co-founder of Irish Village Markets - which operates eight weekly food markets in Dublin and several other events – strongly rejected the claims made by the various business groups, adding that they were just trying to shut out rivals. “There’s nothing unfair. It’s competition. It’s competition which they’re unable to take on the chin. These guys have had it too good for too long,” he told Fora. Vallely said that Irish Village Markets pays a yearly commercial rates bill and has obtained planning permission from all the relevant local authorities. He said that traditional bricks-and-mortar sellers are simply jealous of the footfall that pop-up markets attract. “They’ve no right to the business. Last time I checked, this was an open and democratic society. Vallely also strongly refuted claims that food stalls don’t adhere to the same health and safety regulations as restaurants. He argued that, given the outdoor nature of the business, pop-up operators have to maintain higher standards when it comes to food and fire-safety control. He suggested that restaurateurs should consider opening pop-up stalls as a means of drumming up extra business. Email “'We want a level playing pitch': Retail groups take aim at pop-up markets”. Feedback on “'We want a level playing pitch': Retail groups take aim at pop-up markets”.